Today is my birthday. (yay!) St. Patty’s is a great birthday for an Irish decedent,…. 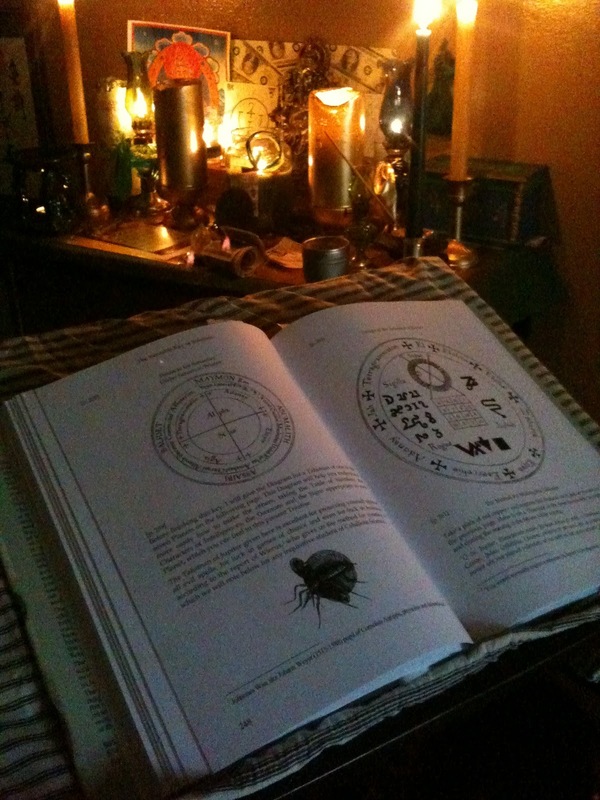 but instead of getting wasted, I thought I’d get up early and do some magick beginning on the hour of Jupiter. I had been planning to create a certain talisman on this day for a few months now. My birthday would be falling on a THURSDAY and only a couple days away from the full moon! Along with some other favorably astro goodies I thought it would be a perfect time/day. 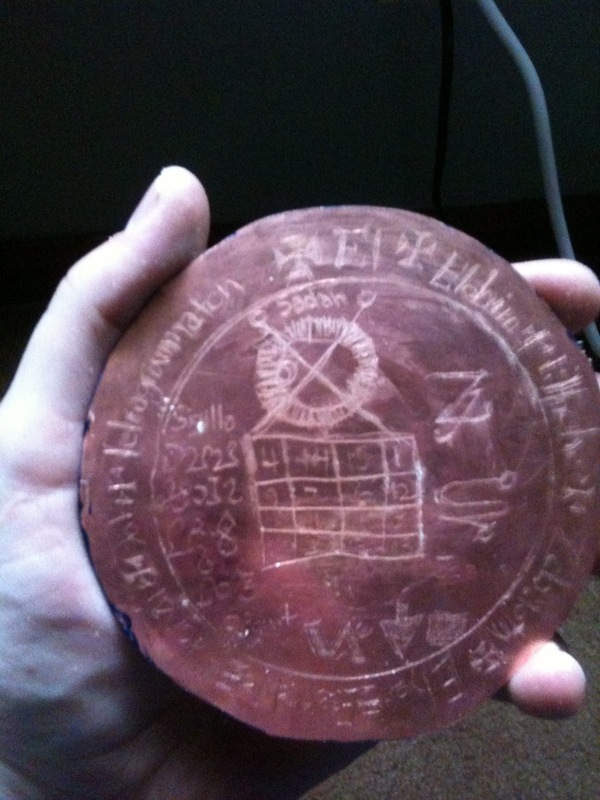 My primary endeavor was to create one of the Jupiter talismans listed in the Veritable Key of Solomon, which David Rankine and Stephen Skinner had published. I want to share with you my procedure after I had done all the essential work. This operation was most wonderful in each aspect and I enjoyed it immensely. It then lists a prayer in Latin which you are to recite three times while making the talisman. Then you are to perfume it with the incense of Thursday (Which I will relate below) and then rub cedar resin onto it with wood aloes and wrap it in a lemon colored silk cloth and carry it on your person. Now before I get into the actual procedure, let me get to the incense for Thursday and reiterate the importance of planing your magical experiments ahead. Gathering needed ingredients can take more time than you ever expected from first reading. I’ll say this now and state that I was missing some of the listed ingredients above. I did not include either swallow blood nor the brain of a deer. I am a traditionalist, but have not used any animal bio material as compound to my incenses. I like to keep incense I’ve made for as long as I can and bio material will putrefy quickly if not used. I used some of the supplements Aaron suggested in his Secrets book to account for this. I do not doubt the effectiveness of the animal material but I had absolutely no sense of inadequacy from the compound I made. The rowan berries were bought from an occult dealer in England. 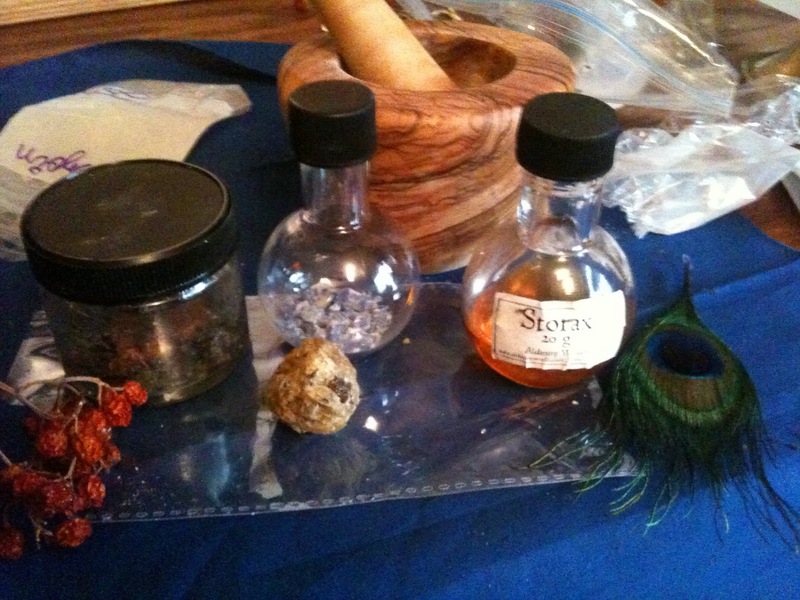 I had Benzoin and wood of aloes left from a purchase from Alchemy works but had to buy Storax from them. Lapis Lazuli stone is easy to come by, but pulverizing it into a powder took some effort and patience. Peacock feathers were bought at a local craft store. All in all, the ingredients were not too difficult to come by. The most challenging part was finding the cedar resin which the book stated should be rubbed on the talisman with aloe woods after you cense it. I looked and looked and couldn’t find CEDAR resin for sale anywhere. Not local or on-line. Luckily, Colorado has cedar trees and some amazing ones were located in a place called Garden of the Gods not five minutes from my house. I know of the method for collecting resin/sap but it was the dead of winter here and the ‘sap just don’t flow’ well at that time. I decided to see what I could find and was fortunate to discover that (some of) the trees already had grains of sap on them. So I didn’t have have to harm any trees to collect the resin and I left a generous offering to the trees/land/nature spirits in the area. ( This gesture is somewhat pagan but one I follow religiously on a constant basis in one form or another. My motivation to magick has always been one of beneficial interactions between all manner of spiritual beings and myself/others) It took me two days of collecting with a few hours out each time to get enough ingredient. Creation of the seal did not take very long but used up the complete first hour of Jupiter to the minute. 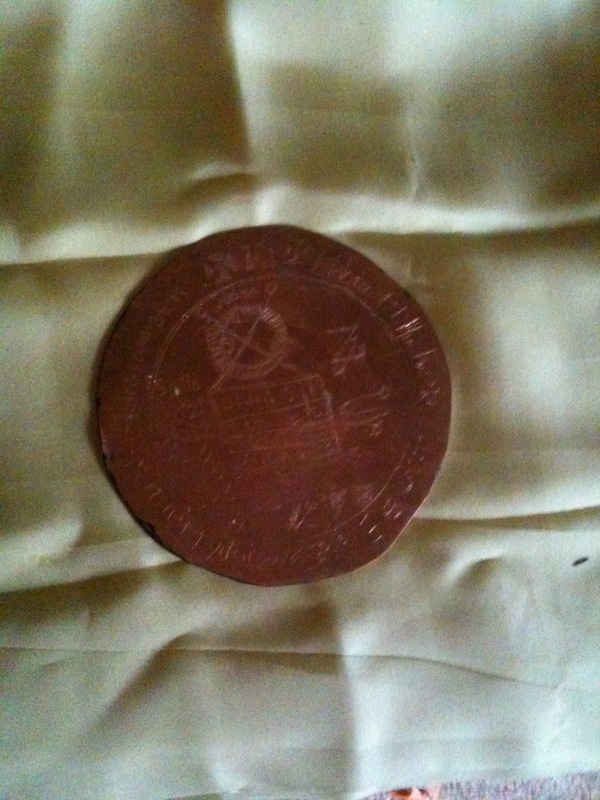 I cut out a disk of the red copper and equal one of tin and decided to adhere them together. 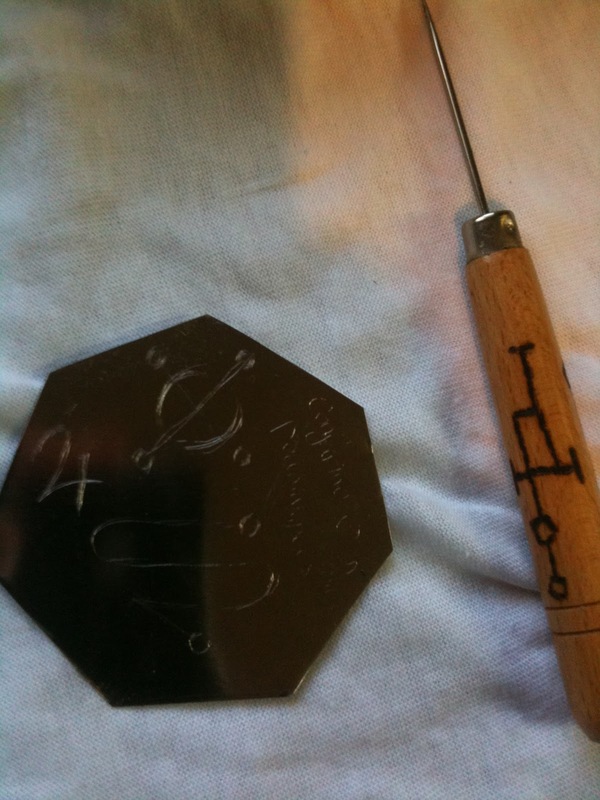 During the process I received a small cut, …and on a whim, traced out the glyph of Jupiter on both backs of the metal before I sealed them together. I recited the Latin prayer once as I began, again after I had almost finished engraving it, and once more before I perfumed it. I also said the English translated version after I began sealing it with the resin. 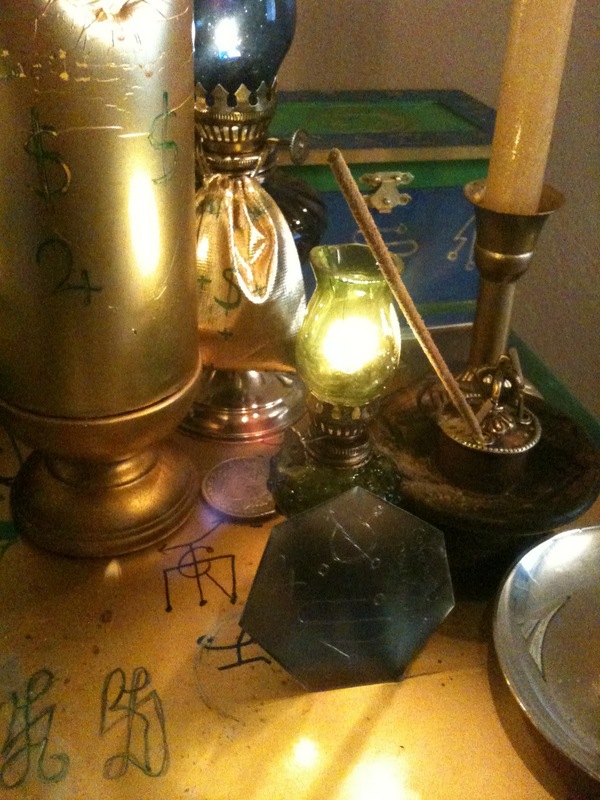 After the talisman was completed and wrapped up in the yellow silk, I placed it in my pocket and went downstairs with the incense burner to my oratory/magical lab. 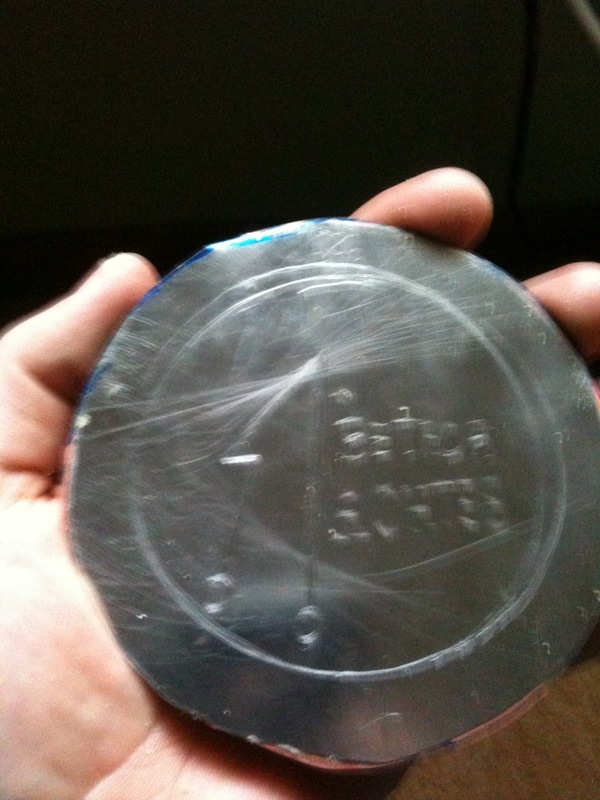 I set the blue incense burner on the Jupiter seal which is engraved on my ‘Table of Art’. (Ars Paulina style). I sat at the alter, lit the holy candle, and meditated. I recited the Jupiter Prayer, invocation, and conjuration. Magick was working as these three verses caused instantaneous energy and awareness of spiritual beings around me. Empowering, invigorating and other sensations I cannot completely define filled me as well as the room. Light seemed to radiate beyond natural luminescence and visions of beings could be scene everywhere out of the periphery of my vision. 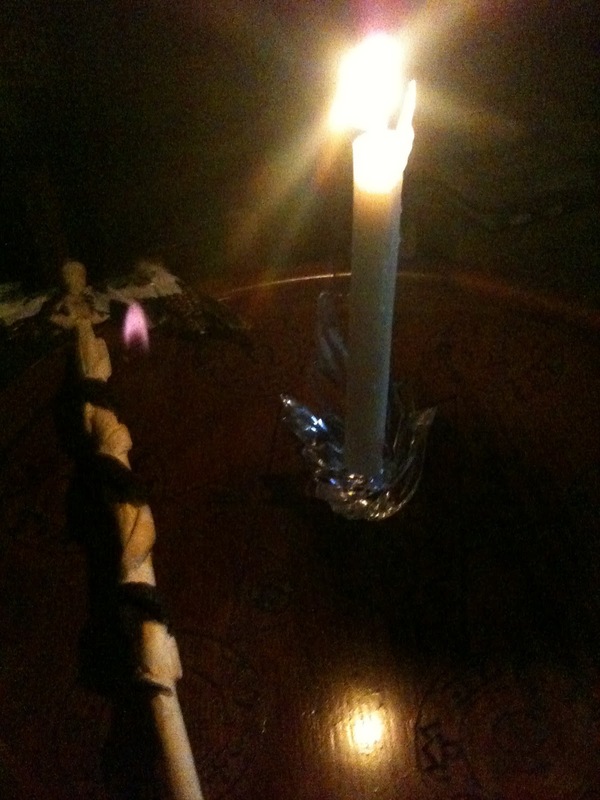 I kept focused on the central candle flame and let the entire experience unfold as it wished. This entry was posted in Talisman. Bookmark the permalink.